Susan (Sue) A. Chin, FAIA is an architect and designer with a very different type of clientele. Currently, her roster includes tigers, gorillas, and sharks, all of whom have very specific design needs. 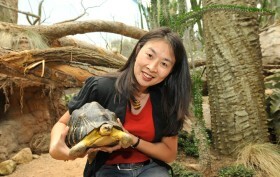 As the Vice President of Planning & Design and Chief Architect at the Wildlife Conservation Society (WCS), Sue oversees the architectural and design needs of the Society’s zoos and parks (Bronx Zoo, New York Aquarium, Central Park Zoo, Prospect Park Zoo, and Queens Zoo), as well as their conservation work around the globe. The organization currently has about 500 projects in 65 countries, which means her work is showcased as far away as Madagascar. 6sqft recently spoke with Sue about WCS, how she got into the field as a teenager, her clients (both human and non), and the exciting new exhibit under construction at the New York Aquarium in Coney Island.